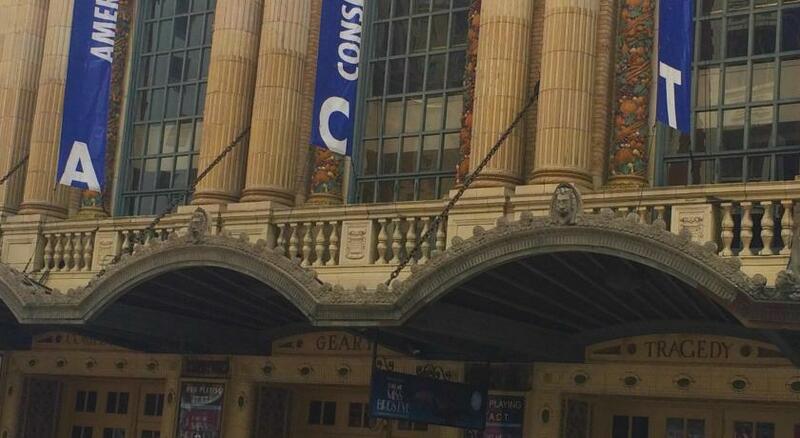 The property is located in the prime locale of downtown. Very close to all convenience properties. 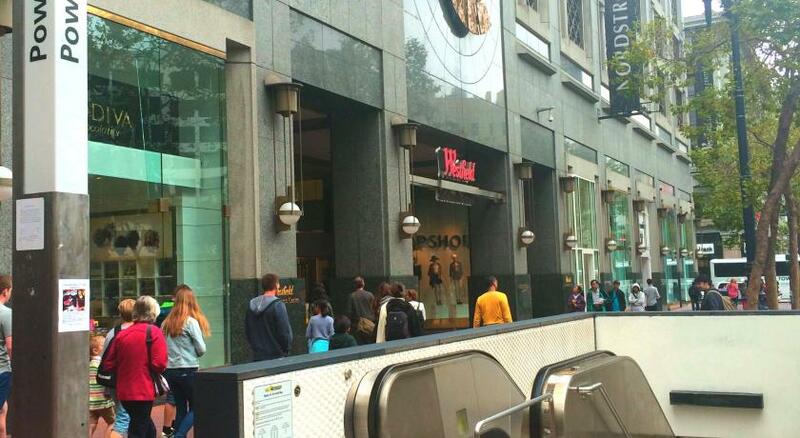 It’s walking distance to the train station. The staff let us borrow some umbrellas because it was raining during our time there. The place is extremely safe and clean. I was so glad we booked here. Also, it was my bf’s bday weekend so we went to the restaurant upstairs. But it was so convenient because we didn’t have to get wet to get there haha since going any where else would have required us to do so! It was very big and close to a lot of restaurants and the shopping center. The only thing I like was the pool and jacuzzi. Nothing else was worth the price. Location/amenities/staff knowledgeable and responsive. Outstanding brunch. People were friendly and nice. Room was nice and big. 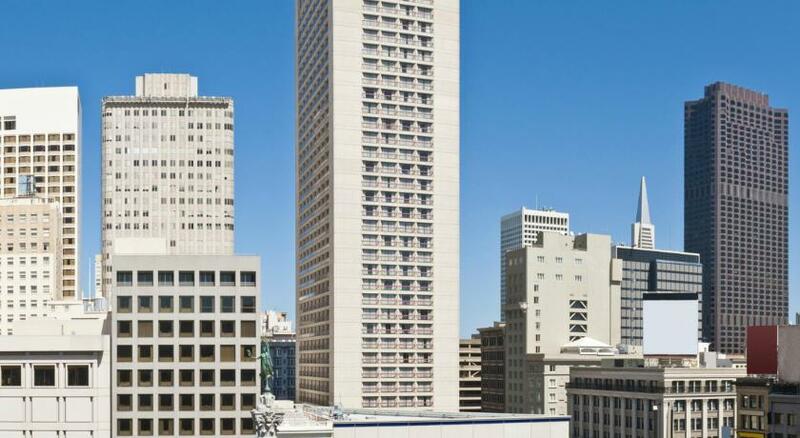 Hilton San Francisco Union Square This rating is a reflection of how the property compares to the industry standard when it comes to price, facilities and services available. It's based on a self-evaluation by the property. Use this rating to help choose your stay! 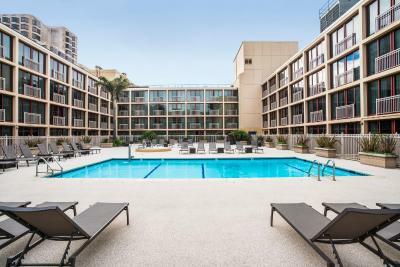 One of our top picks in San Francisco.Located in the heart of downtown San Francisco and just 5 minutes' walk from the Powell Street subway station, this Hilton features an on-site Herb n´ Kitchen and a beautiful courtyard pool. 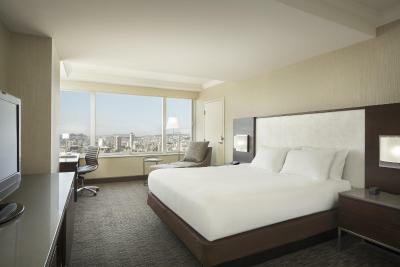 The Hilton San Francisco Union Square offers modern rooms with a flat-screen HDTV and an alarm clock with MP3 player connection. 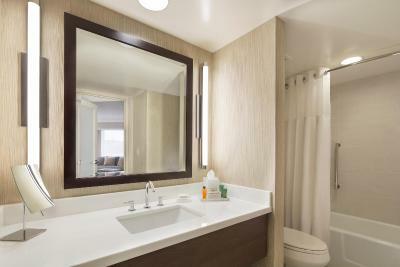 A coffee machine and Peter Thomas Roth bathroom amenities are included. 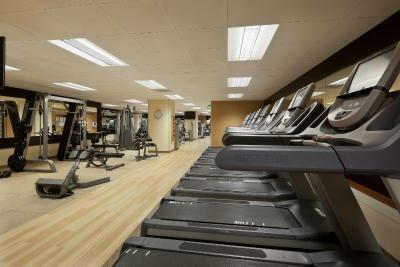 Guests of the Union Square Hilton are welcome to enjoy the 2,800 square-foot health club and relaxing outdoor whirlpool. 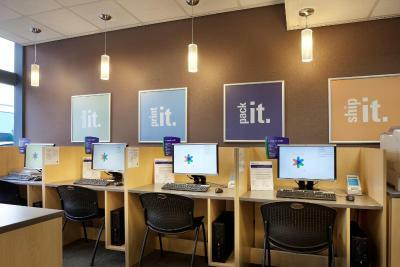 The business center offers public computers, copy and fax services. The Urban Tavern serves an extensive menu throughout the day in an artistic atmosphere. 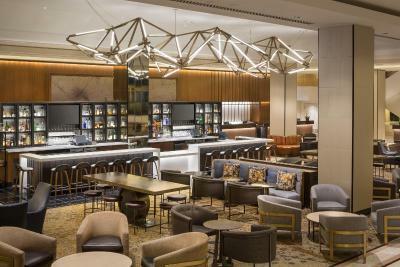 The lounge area offers a variety of sophisticated snacks and drinks. 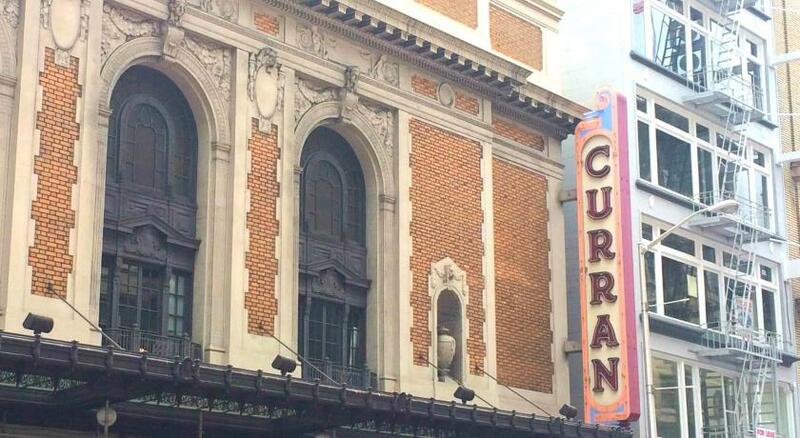 The Hilton San Francisco is 1 block from the American Conservatory Theater and less than 1 mi from the San Francisco Museum of Modern Art. 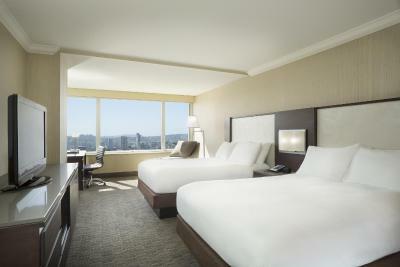 When would you like to stay at Hilton San Francisco Union Square? Known as Classic and designed in ultra-modern decor, this room features a desk with an ergonomic chair. Private parking is available on site (reservation is not needed) and costs USD 76.38 per day. Known as the Classic and designed in ultra-modern decor, this room features a desk with an ergonomic chair. Easy access to the rooftop pool is featured with this room. 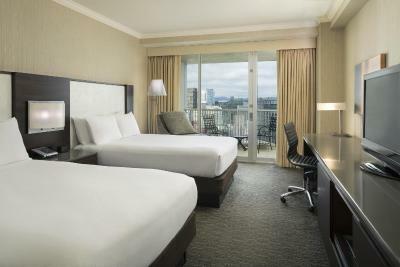 Known as Skyline and featuring a stunning view of city and bay, this high floor room provides free WiFi. A desk with an ergonomic chair and a refrigerator is also provided. Easy access to the rooftop pool is featured with this room. Known as Classic and designed in ultra-modern decor, this room features a desk with an ergonomic chair. Easy access to the rooftop pool is featured with this room. 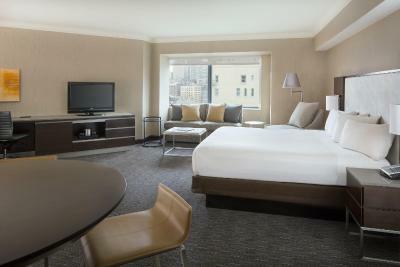 Known as the Skyline, this suite is furnished with a spacious room with 1 king bed. 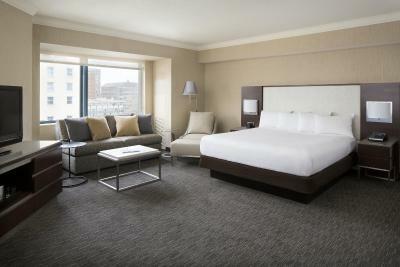 This Skyline View Suite features 1 king bed in the bedroom and a separate seating area. 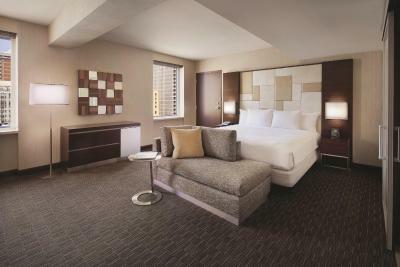 Known as Skyline, this suite features 1 king bed in the bedroom with separate sitting area and is located on floors 30-44. Featuring over sized windows adjacent to an open seating area, this junior suite provides two queen size beds with down white linens, gray and cream accents, and a glass shower in the private bathroom. A flat-screen cable TV and a spacious working area is offered. 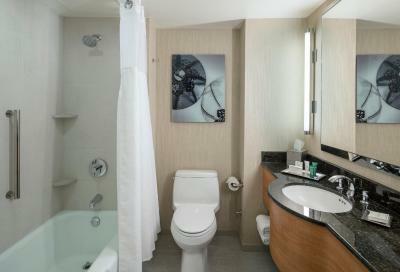 Featuring over sized windows adjacent to an open seating area, this junior suite provides a glass shower in the private bathroom. A flat-screen cable TV and a spacious working area is offered. This suite has a flat-screen TV, an iPod docking station, a minibar, a desk and a coffee machine. 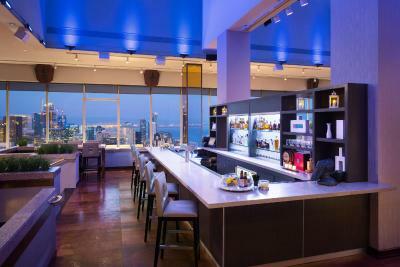 Known as the Skyline and featuring a stunning view of city and bay, this high floor room provides free WiFi. A desk with an ergonomic chair and a refrigerator is also provided. Easy access to the rooftop pool is featured with this room. 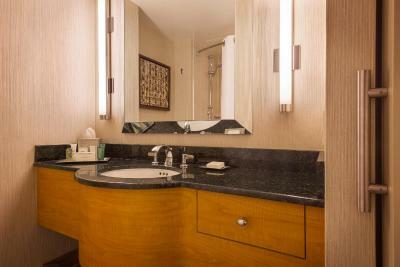 Known as Classic, this room provides an iPod docking station, a flat-screen TV with cable channels, and an private bathroom. 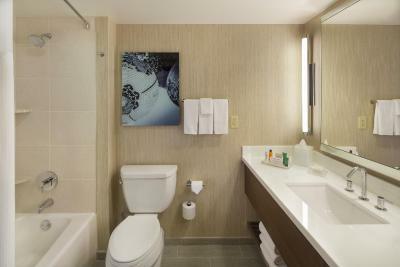 Known as the Classic and styled in crisp white linens, this room provides a flat-screen TV with cable channels, an iPod docking station, and an private bathroom. Known as Classic and styled in crisp white linens, this room provides a flat-screen TV with cable channels, an iPod docking station, and an private bathroom. 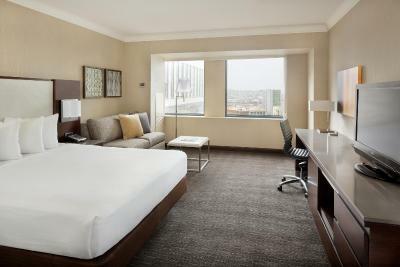 Known also as the Urban Contemporary room, designed in ultra-modern decor, this room features free WiFi, a desk with an ergonomic chair, and a refrigerator. 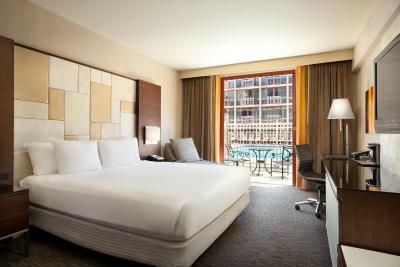 Known as Urban Contemporary and designed in ultra-modern decor, this room features free WiFi, a desk with an ergonomic chair, and a refrigerator. 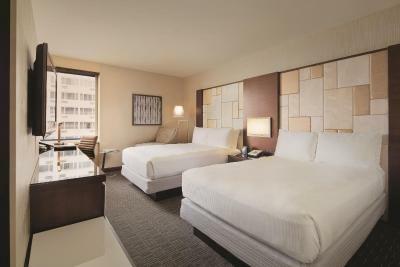 Known as the Skyline, this room features air conditioning and a TV with cable channels. This junior suite offers an over-sized bedroom, a seating area and a private bathroom. This room includes an HDTV with premium channels, a mini-refrigerator, a coffee machine and a large work desk with an ergonomic chair. This room features an HDTV. This double room features an HDTV. 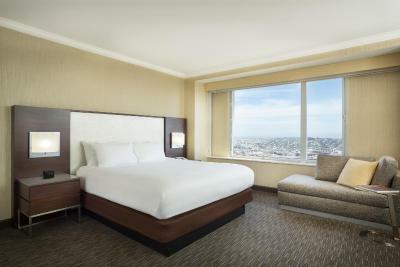 Hilton San Francisco Union Square, located in the Theater District, puts you in walking distance to cable cars and Moscone Center, night clubs, Chinatown and Nob Hill. This historic three-tower hotel provides rooms with city views and Cityscape lounge on the 46th floor. There’s plenty of choice for dining at Hilton San Francisco Union Square. 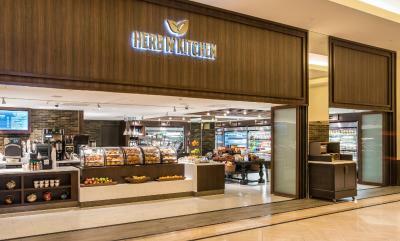 Head to Herb ‘N Kitchen where you can eat your way – sit down, grab and go, or order to your room. 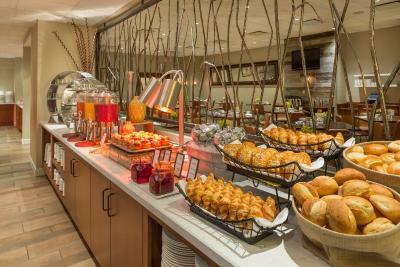 Urban Tavern is the place to be for breakfast and our Lobby Bar is the perfect setting to unwind after a busy day. House Rules Hilton San Francisco Union Square takes special requests – add in the next step! Hilton San Francisco Union Square accepts these cards and reserves the right to temporarily hold an amount prior to arrival. There is a per night incidental charge that is refundable after inspection. Due to fire code policies, 1 extra bed/baby cot is only available in King Rooms. 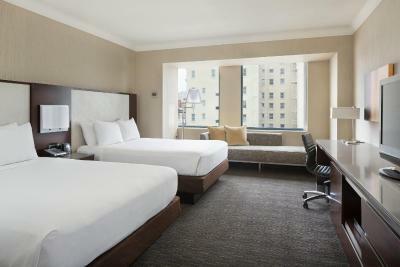 Any type of crib or extra bed needs to be requested from Hilton San Francisco Union Square. Pets up to 34 kg (75 lbs) are permitted, and charges are applicable. 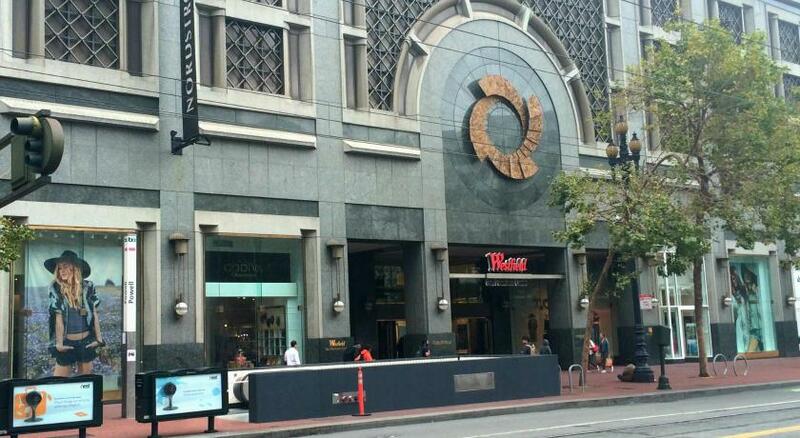 Please notify Hilton San Francisco Union Square if you have further pet questions. If a guest books a room that offers a breakfast-included rate, this room will provide breakfast for 2 guests. All additional guests will be charged. Guests must join the Hilton Honors loyalty program in order to receive free WiFi.